Rc No 443 || Conduct the Competitions for High School Students on the topic "Mahathma Gandhi Freedom Movement and Life"
Sub: Department of School Education - SCERT, A.P., Amaravati - Conduct the Competitions for High School Students on the topic "Mahathma Gandhi Freedom Movement and Life" - Orders - Issued - Reg. 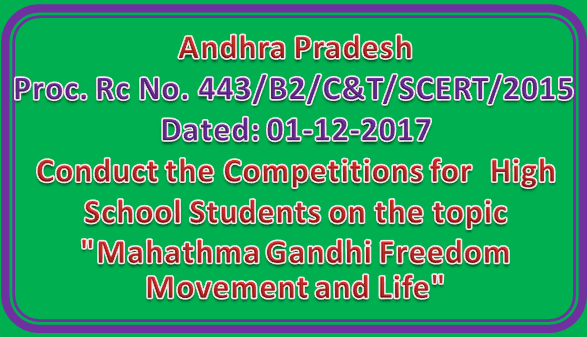 Government of Andhra Pradesh, Department of School Education is decided to conduct competitions on the topic "Mahathma Gandhi Freedom Movement and Life". In this connection all the District Educational Officers in the State are iformed that competitions will be conducted four levels i.e., School level, Mandal Level, District Level and State Level. All the District Educational Officers are informed to communicate all MEOs and High School Head Masters and instruct them to conduct competitions for students studying Class VI to X in all high schools under all managements. The schedule and theme of competitions communicate to all and take necessary actions for conduct of said competitions.